Internet Marketing and More — This site reviews and promotes IM products of the highest value to the consumer, read….. This site reviews and promotes IM products of the highest value to the consumer, read….. I want to preface this by noting that this is my opinion only, based on the hundreds of e-mails about marketing sent to me explaining why this is my opinion. It seems evident to me that we all have a basic understanding of Internet Marketing (i.e. ; niche, sales funnel, giveaways, etc.). However, when the subject turns to Traffic… that is where the road really narrows. New terms begin to appear, SEO, Solo Ads, Generic and the most thrown around term has to be ‘Targeted Traffic’. Now half of us say SEO is dead, the other half says it is doing great, while the rest of us just don’t know. Then we have SEO software that proposes to outsmart Google. Is that really possible? Solo Ads are being advertised all over the net. How can you tell if their list is alive or burned out? Their previous stats tell us part of the story. Also, how many ads they ran tell us a little more also. My question is…can anyone really provide targeted traffic? I suppose if one spends enough money on their ads, they should expect a decent ROI. The solo ad proponents say they always make more in sales than the cost of the ad. I am not convinced that is not the norm though. This comes from personal experience. The ‘Gurus’ throw us all their analytical case studies and screen shots to back up their claims, while the WSO’s sell ‘The Best Traffic Source’ of the week for $9.43. Can you really believe any of this? Now, I have bought most all of the pre-mentioned methods and some that I left out. It seems to me that there is always a “piece” left out of their equation. Then along comes a seller that promises to have that “piece” to make it all work. Now, we can rest easy knowing that this is the real solution, right? Wrong again. If this were true, then the next “Traffic Saver” email or WSO would not appear the next day. So, what do we do? I do not have the answer. However, I would like to suggest that the kind folks reading this to respond with their own opinions and ideas. After all, we are the buyers of all this traffic ‘stuff’. So, let’s hear your views. I thought it was time for something a little different. So this post is about a subject near and dear to my heart. That is classic cars. I am a car nut, old hot rodder and a lover of all cars of the 60’s. This is going to be a short post but an interesting one . I have expanded my horizons somewhat and moved out of my comfort zone. What does that all mean?. Well, I have produced a short book on my experiences with cars of the ’60s. It is titled, “A Survivor’s Tale of the Muscle Car Era”. Like I mentioned, it is short but very to the point. I plan to write a sequel that will take a much more in depth look at this wonderful time for car enthusiasts. Now this little creation is available at Amazon/Kindle. If you care to take a look, here is a link directly to the site. If you happen to like the book, I sure would appreciate a review. Thanks so much for reading. We all hear the phrase “The Money’s in The List”. That is true to some extent. The real phrase should be,”Treat Your List Right and Make Money”. You see, we all try to have a list of people who have the same interests as us and would want to hear what we have to say. Granted as we build our list we don’t really know anything about our subscribers at first. That is where the follow-up emails will help us to get to know our subscribers better. The ideal method to entice someone to exchange their email address is to have a quality product to give to them in return. I think we all have been offered items of various upfront quality. Now, I am not saying that these offers are good or bad. I have signed up for many lists and received something of good value often. The reverse has also happened frequently. My personal plan is to offer the best quality product I know of in a particular niche. That being said, I am offering a brand new product that no one has seen before. Actually, I may begin to sell this product at a later date. But for now, it is free and I want to see how it does. Now this product is an exclusive list building software package that has not been offered previously. So, for anyone who would like to try it, please use this link. Thanks for reading. Hey, Where are the Instructions? Hello everyone, Do you know anyone who has purchased an iPad lately? I do and where are the instructions? One person I know said “Oh, I will take a course”. I am sure not going to do that. When you think of all those people getting their first iPad and having to start from scratch to work it. Doesn’t make any sense to me. I recently came across a site that provides iPad video instruction lessons. You can watch them at your own pace and go back and watch again. I think that is more convenient than taking any class. There are over 100 videos to choose from covering all aspects of the iPad. Along with that you get lifetime access and updates. If you want to get the most from your iPad, have a look at this link for all the scoop. What do Webinars Really Bring? This post again is not about my primary topic of IM product reviews. However, this has been on my mind for sometime and I wanted to air it out. My question is…Do Webinars really provide a service for their audience? When I attend a webinar I expect to learn something I did not know or have it explained in a different manner. Now, having attended many webinars, I find they can be classified in three distinct categories. 1. Short, about 1 hour. Free, that usually means minimal content. Pitch at the end, reasonable. 2. Longer, about 1-2 hours. Fee, that usually means more bio info from presenters. Pitch at the end $$ more costly and can be a membership style. 3. Very long, about 2-3 hours. Fee, very expensive, usually means lots of talk and filler. Pitch at the end $$$ very expensive. I have attended many 1 and 2 style webinars but not style 3 because of 1 and 2. I will explain that. I feel that most previous webinars were presented solely as a lead in to their pitch. For that reason I feel that style 3 would be no better, just longer. So, that being said, do you think you are getting your just worth from webinars you have attended? Twitter has become the number one social media platform, in my opinion. Why? Well it is fast, does not have as many rules and has a multitude of uses. One thing Twitter users want is more people to follow. So, how do you get people to follow that all have similar interests as you? Good question, eh? What I use is a Software Product called Tweetadder. This amazing product literally does it all. It allows you to follow tweeps with your interests, ideas, language and so much more. How is this done? Well, they have automated search features that allow you to find people using keywords that you choose, putting you in total charge. Not only that, but they have automated “following” and have a device to “unfollow” folks who don’t follow back. As far as I am concerned, this is the only Twitter tool that I need. I use this tool all the time and recommend it. Follow this link for a complete explanation of all the features of this product. This post is again drifting away from my main theme. However, I feel compelled to discuss this subject. My true passion is anything cars, mainly ’50s and ’60s to be exact. What brought me to write this was watching the classic car auctions on TV and having seen them in person in Monterey. I suppose my main point here is the comparison between the deep pockets of folks trying to set new records for cars maybe not worth it and the folks, like me who remember the way it was back ‘In the Day’. So, what does that all mean? There are many theories on what drives people to collect expensive cars. Most of the time I feel these people have made their fortune and want to be recognized for something other than just overly wealthy. Then again there are the older folks trying to bring part of their past back to life. Make no mistake, this is not ‘mid-life crisis’ slop that gets thrown around. That is a totally different part of the brain I shall leave alone. Where, you might ask, do I fit into this? Well, I am another species of ‘car guy’. I grew up during the wonderful days when these cars were just cars. Some, of course, were always special. I remember when it was easy to tell the make and model of any car on the road. Now, sadly, the average car on the road looks like a Honda whether it is or not. Am I whining? Absolutely. I won’t list all of the makes that I have owned as ‘daily drivers’. But I will mention an actual experience from 1967. I went into a Ford dealer in San Francisco and on the showroom floor was a Shelby Cobra 427. Sticker price was $7500 and was worth every penny. As I was closely examining this vehicle, the salesman said “Hey, you with hair, get away from da ca. It has an aluminum body ya know”. Thanks clown, I never knew! I was paraphrasing just a little there. So, if money was no object, what would I like to own? 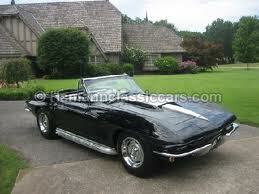 That is simple, it would be a 1967 Chev Corvette, 427/4 speed, triple black roadster. See picture at top. Leave a comment as to what you might want to own. I am curious. Readers of this blog are used to seeing reviews of marketing products. Well, I am taking a detour based on some local news that has me hot and bothered. Now the big news is BART is finally coming to San Jose. Let’s look at this for a moment. Contra Costa County has been paying into the Bart Tax since its inception. My math says that is over forty years. Well, part of the plan was to widen Hwy 4 and have BART extend to Antioch. The widening started, Bart extended to Pittsburg, then….STOP! BART needs to go to SFO first. So….widening of Hwy 4 stopped. The result was moving the bottle neck a little further east, but not much of an improvement. Now, with the airport BART build working, it must be time to continue in Contra Costa with their BART extension. The residents thought so, but wait….another brain storm. San Jose deserves it more even though they did not pay into the tax fund. That’s OK, cause they will pay cash. The East Bay knows where this went. The widening again started after a long shutdown and the BART planners decided all the extension had to be was just a little eBart shuttle that would maybe be completed by 2015. Paying into that tax for so long will not give the residents what they deserve. I live in the SF East Bay and have seen this all unravel from the beginning. I believe the County deserves far better than this and should make more noise that it has. Meanwhile, this sad saga continues. I don’t have much faith in that 2015 date. However, all we can do is wait and see. Thanks for letting me rant off subject. I will be back soon with more relevant content. Let me start by saying that “The Super Affiliate Handbook” by Rosalind Gardner was the very first book that I purchased to learn about affiliate marketing. Since then, I have countless other published books, newsletters, etc. However, I still believe this is the most thorough and well designed guide of its kind. The author knows what she is talking about. She is a Super Affiliate and can prove it. Her web site has numerous testimonials from well known people in the Marketing field. So, what about the book itself. It is chapter in verse of all the basic and not so basic ingredients, well written so that anyone will understand how to start affiliate marketing. The amazing part is that Rosalind has knocked the price down 70%. Now this is a deal not to be passed up. For more information, check out the site. Thanks for reading and follow me on Twitter @sharkyrkk. How Will The New Year Affect Your Life? This type of subject normally leads to New Year’s Resolution talk. I do not put too much emphasis on these goals people talk about in January. They seem to be areas that need improvement but won’t get it this way. My feeling about changing any part of your life will happen when you are ready and not a moment sooner. Also, a person’s attitude directly affects the mental approach to any situation. Negative thoughts will not produce any positive results. One has to have a positive mental outlook for any life changing situation to be of benefit to them. Now, goal making is another story. There is incentive to succeed when there are goals set and you can see yourself moving towards a certain level. It is a good idea to set short and long term goals to keep the momentum moving forward. It also been said that setting a long term goal that seems unattainable will keep your subconscious motivated. My best advice is to do what feels best and always keep it positive. I would appreciate any comments. What are your goals?